Goings on in NYC.... yay Anne! Finca Mauritania - Aida Batlle Santa Ana, El Salvador. Roasted by Counter Culture Coffee. Finca Los Planes Pacamara. Sergio Edmond Ticas, Citala, El Salvador. Roasted by PT's Coffee. Finca Cerro las Ranas. This coffee is so new, there isn't a description online yet. From Barth's note: It is a pulped natural coffee. This would tend to "naturally" put the coffee into a low acidity category which would be quite atypical of a Central American coffee. Roasted by Barrington Coffee. Rwanda Burema. Roasted by 49th Parallel Coffee Roasters. Zirikana, Rwanda. Roasted by Intelligentsia. Rwanda Rusenyi (no longer available on the website). Roasted by Counter Culture Coffee. Thanks everyone for coming! It was a blast! Greetings once again from Addis. We have just returned from five days in Djimma and the surrounding areas. The annual Roundtable was a great success. Over forty Ethiopian producers and exporters were in attendance, along with guests from Europe and North America. There were presentations on sundried natural coffee, on growth in the specialty market, on the successes and challenges of various programs and initiative. All in all, I learned a ton about the coffee industry in Ethiopia, both in the commercial and specialty markets. I also gave a brief presentation on the "super-specialty" movement in the United States. But sitting and talking, as interesting as it might be, can never be as memorable as traveling to new places and meeting new people. In the short time we had, we managed trips to several different farms and hulling stations. On Wednesday we saw the area around Limu. On Friday and Saturday we went and visited Bonga and Wush-wush (more than halfway to Tepi). These are origin names that probably ring a bell for people who work in the specialty industry, but they have nowhere near the renown of Yergacheffe or Harar. Why is this? Is the quality really that much better in Yergacheffe? My inclination would be to say "yes." I love Yergs more than anyone. However, I have tasted fantastic coffee from Limu and Djimma in the past, specifically through the Ecafé Gold auction in 2005 and 2006. So many of the coffees from these areas however, are being sold at commerical auction in Addis Ababa or Dire Dawa and end up getting treated the same as the worst dreck from Vietnam. The people in Yergacheffe, on top of their fantastic coffee and meticulous processing, have also had great success in finding specialty buyers for their coffee. The importance of identifying great coffees right at origin and holding them out for the specialty market was one of the focuses of the Roundtable. Willem Boot gave a presentation on the importance of regional cupping labs. By cupping coffee closer and closer to the field, producers can catch taints and defects before they become too costly; and, furthermore, they can find their "emeralds," as Willem puts it and then find a buyer for those gems. It's well worth the trouble. Most of the cost of production has already been spent: on labor, on soil inputs, on all kinds of other expenses. The additional cost of cupping and lot separation is a significant amount, but still only fractional to the main cost of producing the coffee. And the price great coffee can fetch is regularly double or even triple. Of course it is not merely a matter of copying Yergacheffe or Harar. The great potential of these distinct regions is that they are truly distinct. Moreso than in any other coffee producing country, farmers on a different hillside, let alone from a different region or wereda (small district), are likely to have different tree varieties. There is a huge range of unique flavors and aromas waiting to be discovered. We don't even know yet what we are missing. The astonishing success of the geisha variety in Panama is testament to just how great these hidden gems could be. 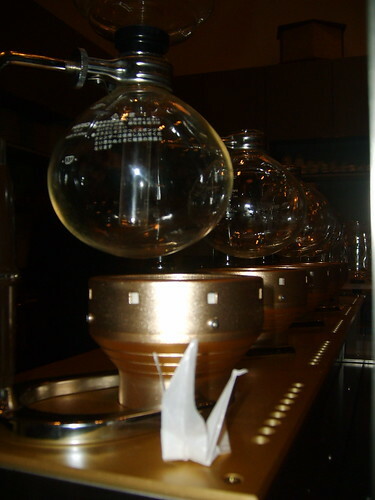 And who is to say that geisha is the endpoint of quality? Almost certainly it is not, as long as we continue to push in the direction we have been. I believe that things are changing in these other regions. From the talk of the people at USAID/Fintrac, we should see some great single-origin coffees coming out of Tepi soon. Someday, perhaps very soon, the origins Tepi, Limu, Illubabor, and Bonga may be as well-known, and as treasured by coffee lovers around the world, as the famous Yergacheffe is today. Tomorrow morning early we are flying to Dire Dawa to see some famous exporters there, and the commercial auction as well. We'll be seeing the famous ancient city of Harar and returning for Ethiopia Limited auction activities on Thursday. I expect I will be out of internet range again till then, but if I find an opportunity to post in the meantime, I will. Greetings from Addis Ababa, the "New Flower" of Ethiopia. In a whirlwind couple of days we've seen dancing and singing, crazy driving (of course), stunningly beautiful women, and lots of sunlight. All at 2800 meters elevation. Yesterday was the 2008 Ethiopia Buyer's Forum put on by CQI and the Ethiopian Coffee Exporters Association. I only caught a little bit of the forum (at King's Hotel) because my Ethiopian counterpart Daniel Mulu and I were dashing all over the city getting ready to host an afternoon cupping and preparing for the rest of the week. I wish I had been able to hear all the speakers, but it was a bit of a blessing in disguise: I saw countless different Addis street scenes, from the charming to the bustling to the strange. This morning we are taking a puddle jumper from Addis to Djimma, where we will be doing all kinds of walking tours, plus more cupping, more presentations, and more discussion. I'm uncertain what my internet status will be. I will try to post if possible; otherwise I'll be returning to Addis on Sunday with lots to tell! I am back in NYC right now, but I am leaving this afternoon for Africa. I will be in Ethiopia for close to four weeks, working on the Ethiopia Limited coffee auction. Not that I have been posting regularly at all lately, but I will probably be pretty sparse in my posting until I return to the states on March 11. Hello from El Salvador once again. Training with Salvadorna baristas has finished, and everything went great. Using coffee from their own farm for espresso, the Flores family has made some great drinks. I have lots of great pics and stories to share when I have the time. Right now I'm just relaxing a little at the beach with my big sister. We're heading back into the city on Saturday, then Sunday it's back to the USA for a few days. I managed to get several pounds of fresh crop coffee from El Salvador... stuff that cupped out very nicely earlier this week. It's being shipped to New York and I hope to roast it and share it with friends before I leave for Africa. If you came to the El Salvador cupping at the Tasting Room at the end of 2007 and you put down your address, you can expect your promised fresh crop coffee soon. Back at you when I can manage it. Peace! ¡Hola! El Salvador is lovely as ever. 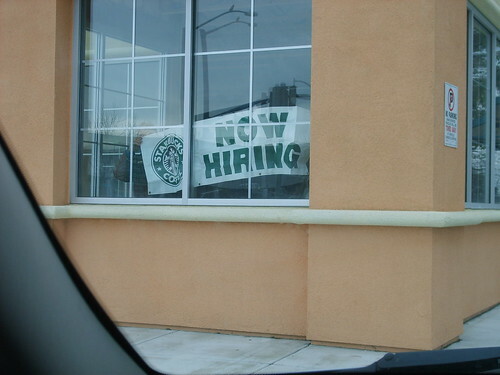 Barista training exercises begin this morning. The only coffee I had today was some horrible airport coffee which only lasted a few sips before I gave up and tossed it out (why do I do these things to myself?). Tomorrow, however, I'll be playing with fresh crop, fresh roasted 100% bourbon from farmers who care. Indeed, the very people pulling the shots will be the people who planted the trees. But more on that when it actually begins. In the meantime I want to take this chance to mention two other places I post on the web, both coffee related. I am working on another big web-based project, but it will have to wait until I return from Ethiopia in late March. In the meantime, first of all, there is Coffee Scholars, the home of my consulting company. This is my professional site. That's right! I'm an actual professional. That's where all these cool trips ultimately originate. I rarely mention my company because I want this blog to stay about the coffee. But while I am bringing it up, feel free to click over and bookmark it, and tell anyone who you think might be interested. Second, there's Matt Miletto's new and already hugely popular "Barista Exchange." It's basically like MySpace for coffee professionals. Just when you thought we couldn't possibly get any nerdier. My profile page is here</i>. Poke around this site... there's lots of great stuff including a worldwide calendar of events and good discussion forums. And if you work in coffee, sign up and add me as a friend! 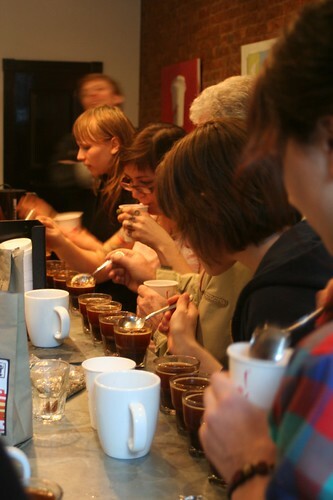 Yesterday afternoon, Taylor from Crop to Cup organized a little cupping at Gimme! Coffee on Mott Street. If you notice lots of mentions of this store on my blog lately, it's because Mike, Mark, Kevin, and the rest of the rad dudes at Gimme! have basically opened up their store to the New York specialty coffee community in the name of free exchange and great coffee. 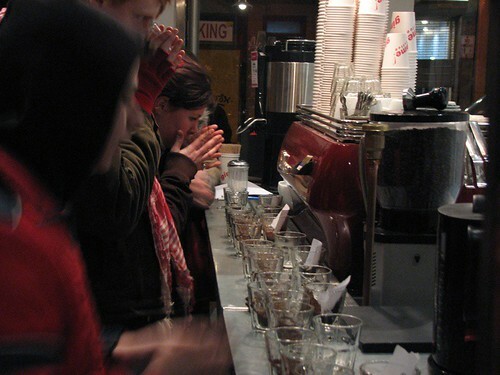 They've let us hold multiple cuppings there, and there will be many more coming down the pike. We will continue to do stuff all around the city, but it's so great to have a home base right in the heart of the city like that. Not to mention the bomb espresso available for when people get tired of drinking from a spoon. 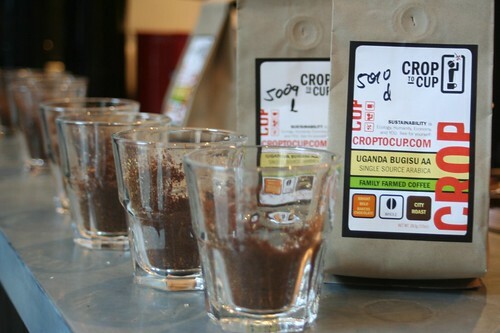 On the table yesterday were fresh samples of this year's crop out of Uganda. 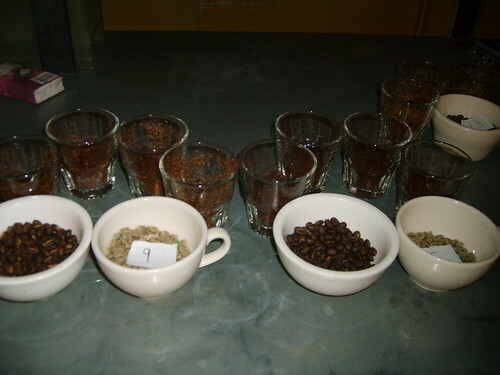 These were samples we had hoped to have for our coffee night in Harlem a couple weeks back. The exigencies of getting tiny samples across the great bulge of the planet from east Africa to North America made for some delays. But the coffees finally came, and Taylor roasted them up for our perusal. Jenny from Gimme! also brought some coffees from Intelligentsia (a Rwanda blend and some of the great Tres Santos from Colombia). 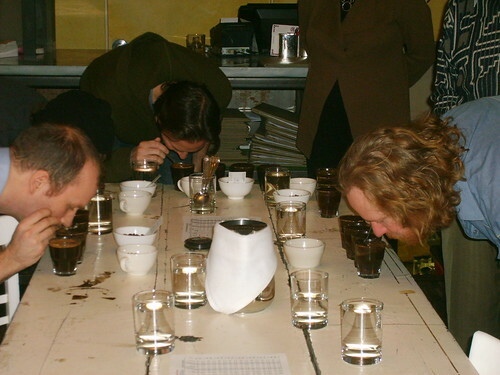 Of all the coffees on the table, Crop to Cup's "sample 5010" really stood out. This coffee won best in country at EAFCA last year. This was actually a blend of smallholder coffees that will be available on an individual lot basis once the crop becomes commercially available later this year. I can't wait to try the individual coffees, because they are clearly a very high quality. This coffee (which Taylor roasted to two different colors, giving a great picture of the potential there), was lively, sweet, and smooth, with honey and lemon aromatics. Great stuff... I gave it a 91 in my casual scoring round. Great to see so many coffee peeps, as usual. Thanks to Taylor and Mike for making it happen. You can see a few more pics over at flickr. In my next post I will be coming at you from El Salvador, where I am doing some barista training. We'll be working with some of the coffees that I saw ripening on my last trip there in November. What a great time of year for coffee lovers! So much fresh stuff to try! I'll try to bring some back so we can do it up right in NYC. Hi. I'm back in Brooklyn. In my last post I said I thought that Blue Bottle's new location (which is not exactly in the Tenderloin district, as an astute reader noted) deserved its own post. Next best thing is top billing in this cattle-call post. Blue Bottle, as the New York Times noted, is using a beautiful Japanese individual cup brew bar to do its "drip" style coffee. Unfortunately they had already shut it down by the time we drove in from Mill Valley after a day of sample roasting. But essentially its a souped-up vacuum pot set-up with gold trim and a multiple brew spots. Really, really great stuff. Right next to this set up are the real attention-getters: two huge slow-brew (or "cold brew") systems, also Japanese style. Conceptually, it's similar to "toddy" style coffee... in that it uses unheated water to extract the coffee over an extended period of time. But the drip-down style makes for a different experience entirely. Arno said they were still working out the kinks with one of the systems to keep the center of the grinds from getting overextracted (like you see in an electric Mr. Coffee). But the other one was working perfectly. The coffee we got from this (a pulp-natural Brazil, I believe) was like a liqueur. Incredible. It was thick and syrupy without being heavy. It had intense herbal root and black cherry aromas, and very little of the quinic nastiness that you get from many slow-extraction processes. Texturally and in terms of intensity of flavors and aromas, it was like a fine dark rum or maybe Tia Maria, but better. This was the real star of the show for me. Amazing! I can't wait to try more coffee in this style to see how different coffees react to the process. Not to mention the great clean design there, and the Jules Verne-ishness of the brew bar, and the lovely macchiato I got, and the prompt, friendly accommodating service from the head barista, Sarah. Blue Bottle = WOW! Also in California, attending the Boot Coffee workshop, was Philimon Natibe, from Zimbabwe. 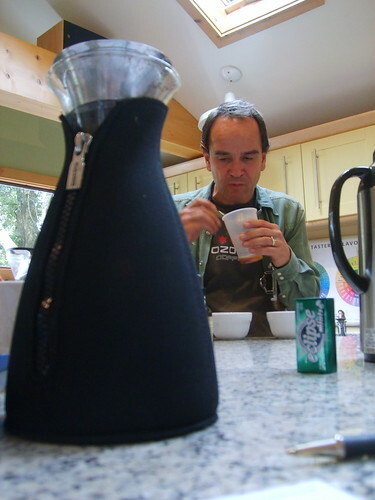 Phil lives in Texas now, but he used to be a coffee farmer in his home country. He's a really fantastic guy, and he has great plans for fine coffee in the future, both in the States and back in Africa. Phil can't go back to his own home right now, however. He and his family were forced to flee their home because Phil has dared to oppose the dictatorial regime of Robert Mugabe. Google the name Philimon Natibe to see just how active Phil has been in his opposition. He told the Boots and me some incredible tales from his home and his struggle against Mugabe's abuse of power. The nutshell version of the Mugabe story (my cursory understanding gained through general reading before meeting Phil) is that he was elected in Zimbabwe as a democrat and a patriot. When his time to step down came, he refused and now uses the military to squash opposition. Farm-owners, mostly white but also black like Phil, have been stripped of their land, which is now mismanaged or sits unused. Zimbabwe was once the breadbasket of southern Africa, growing and exporting food crops (and coffee!). People were poor by Western standards, but starvation was never an issue there. There was lots of food to go around. Now famine is common, thanks to the dictatorial murderers in charge. Zimbabwe still holds "elections," but no one believes the results for a moment. All a charade. Phil says the only upside to the disaster in Zimbabwe is that the land now lying fallow will be that much more productive when the old egomaniac finally kicks the bucket. He plans to go back the moment Mugabe dies and get more land and begin planting coffee all over again. In the meantime, Phil has just bought a commercial roaster and will be roasting exclusively African fine coffees in Texas very soon. You can bet I will post something about it on this blog when it goes up. Hopefully, someday, we'll be sitting together on a farm in a free and democratic Zimbabwe with Phil's family, enjoying a cup of world-class coffee. Also during my trip, on Saturday, Willem, a couple of friends, and I had a chance to try a pretty wild cupping experiment. I can't reveal much about what we were doing, because some of this is proprietary information. It involved an additive to the coffee, which if you know me at all is something I usually consider anathema. The results were highly intriguing though. Just a drop or two of magic gold and things were very, very different. What was the magic liquid? MuaahahahAHH! Next post: Ugandan goodness in New York City. The Bay Area is beautiful and wonderful as always. 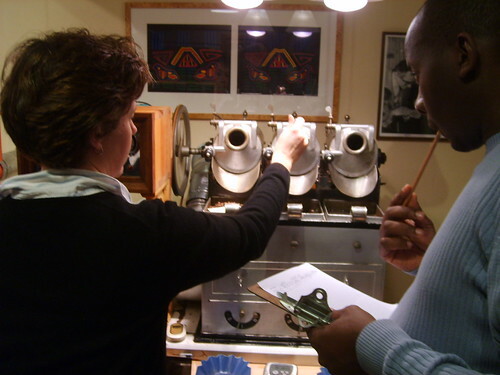 Our class of coffee roasting students includes a woman from Ireland, a man from Zimbabwe, a man from Australia, a Quebecker, and assorted gringos y gringas. Plus of course the Dutch maestro, Boot. I promised more on the Peet's roastery, but things are moving so fast right now! Without pictures it's hard to post much. I will have to do some sort of epic round-up when I get back to NYC. 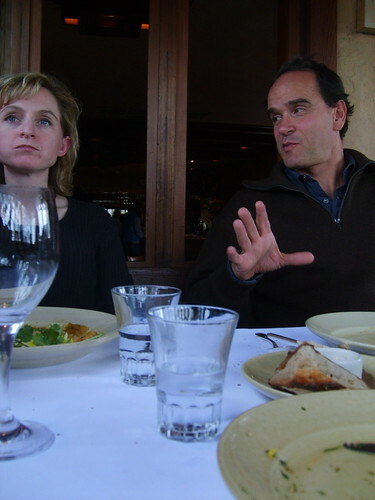 On Tuesday, after Peet's, Willem, Andi and I went to Chez Panisse (bad web design, world-famous food). What a freaking great restaurant. Afternoon lunch on a rainy weekday, and I felt so happy to be there. Service was impeccable. Food was outstanding (creme fraiche/butter lettuce... roasted chicken breast/rosemary/roast onions... coconut ice cream/chocoloate... muscadet....). ... Willem, as usual, is telling an amusing anecdote from his coffee travels while Andi ponders the future of the specialty industry in El Salvador and her next gig leading yet another epic tour of the Salvadoran countryside. 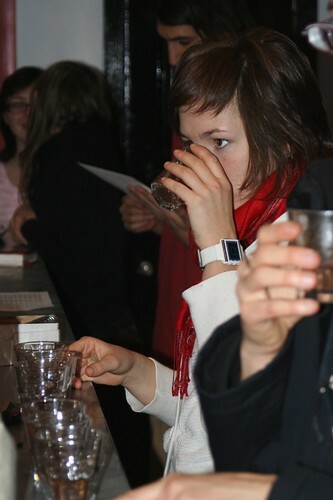 Wednesday was all sensory evaluation and cupping and fun at Boot Coffee's Mill Valley facility. We analyzed different kinds of apples for acidity and sweetness, and mangos and avocados for mouthfeel. A little Nez du Café action led by yours truly. The pupils are all fantastic and gifted and very nice, and interesting! Wednesday night we went to Blue Bottle's brand new location in the Tenderloin district of San Francisco. I really feel this café deserves its own post. Along with the Peet's roastery, I feel I have to reserve this for when I have proper photos posted and can devote full energy to a post. At last, the $20,000 cup of coffee. Back at you tomorrow with tales of resisting dictatorship in Zimbabwe! The third event from last week that I was too busy to blog about in a timely fashion was our Ethiopia cupping at the Tasting Room. This was the quietest and most intense of the three, and it featured the most rare coffees. I want to thank everyone who came, and as always the wonderful people at the Tasting Room. 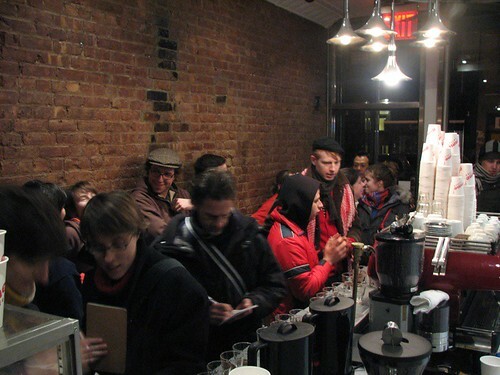 I have hosted and attended quite a few events there now, and I can safely say there's currently no better place in Manhattan to find a unique coffee event. I hope John and Katie from Counter Culture continue to do things there; I certainly will try to. So the Ethiopia cupping is not all sound and fury. There's a real method behind this madness (unlike most of the madness which is, to be honest, usually random and aimless). Part of the reason for this event was to drive up awareness in the industry of the 2008 Ethiopia Limited auction. This auction is important, and exciting. I blather on and on about great coffees on this blog. But how do those great coffees get to my doorstep. It's a long and tenuous chain. Some roaster had to source them, often through an importer. And the importer had to have a reliable source for the quality beans. The grower and co-op and the processing station all had to find a market for their product. And that's the short version. The short, short SHORT version. Ethiopia Limited is a way to get great coffee from Ethiopian farmers directly to roasters. Ironically, in the land where coffee was born, the very womb of coffee itself, the chain is very muddled and ruptured. The Central Americans have a much stronger tradition of auctions and "Direct Trade" coffees. I am honored to be working on this project in Ethiopia. Frankly, I don't have time to write a post that will do the program justice right now. But this post is the introduction. October and November were all about El Salvador on this blog. The rest of this winter and the spring will be about Ethiopia (although I'm heading to El Salvador soon, and I will definitely post on that, too!). I'll be posting as much as I can about these coffees, about the work we are doing, about the people that are involved, and about how you can get ahold of these coffees over the next month. Mid-February I am headed to Ethiopia for a month, whereupon I expect my posting to be sparse for a while. Mid-March I will be back with many pictures and lots to talk about. There's so much work to do and so much to talk about. Stay tuned.... In the meantime... I'm in Northern California right now and it's so damp and cold! I went to the new Peet's Coffee roasting facility in Alameda today... BIG! More on that tomorrow.